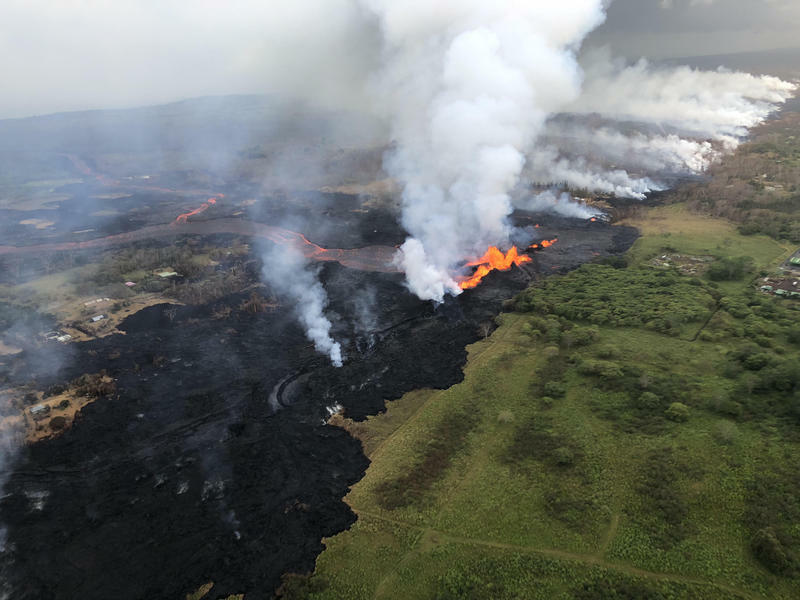 As of June 10, 2018, Fissure 8 continued to erupt vigorously with lava streaming through a channel that reaches the ocean at Kapoho Bay. The width of the channel varies but averages 100 to 300 yards wide. 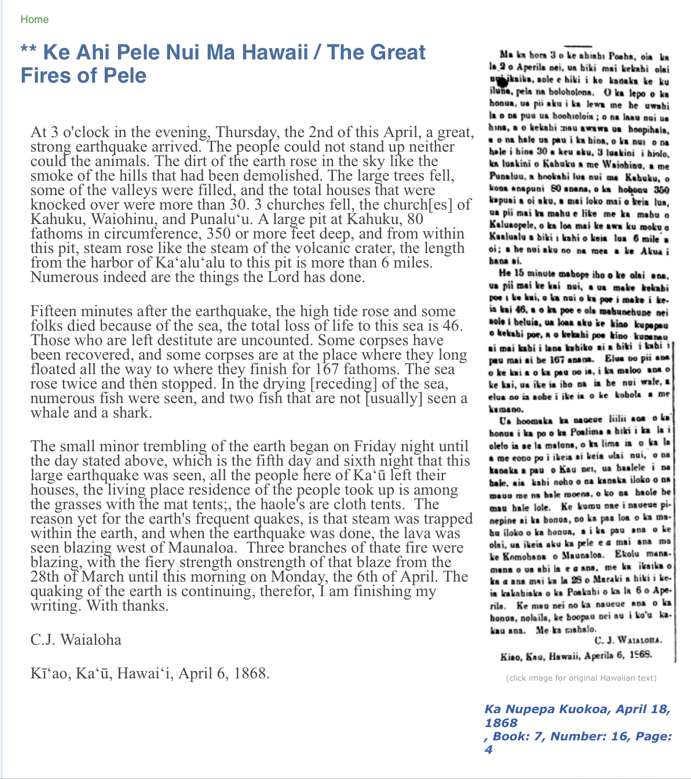 An example of a story from Ka Nupepa Kuokoa, April 18, 1868. These newspaper articles are largely searchable through the Institute for Hawaiian Language Research and Translation website which is currently under reconstruction. Please use the link provided in this story. A glimpse at references to past volcanic eruptions in Hawaiian language newspapers from 1834 to 1948. Reading newspapers used to be like turning on your phone, says Paige Okamura, graduate research assistant for the Institute of Hawaiian Language Research and Translation. Her project focusing on seismic activity, tsunamics and eruptions, is funded by the Joint Institute for Marine and Atmospheric Research. 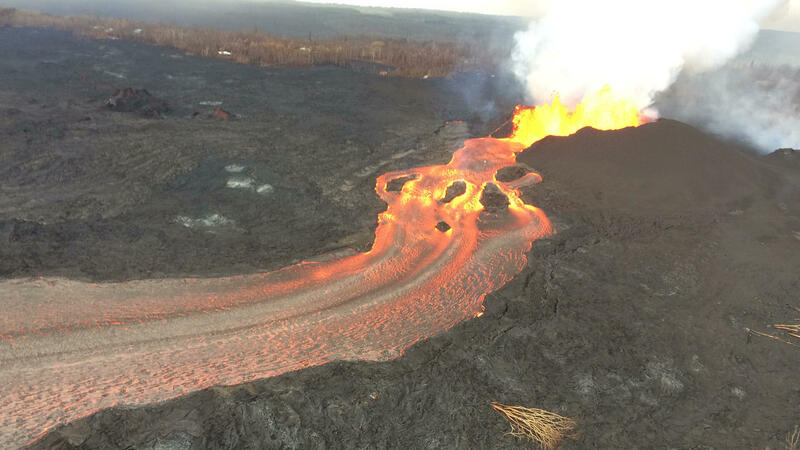 Okamura: Flowing of the lava, the fissures that are happening today, they've seen before as well. It’ll talk about how the earth cracked wide open, and so the same things we would see today, that we see in the videos, they're reporting the same things. Okamura: It will talk about during earthquakes when all the glass bottles in all of the shops have cracked. It talks about some buildings fall over, collapse. There are accounts where fishpond walls crumble. They’re reporting anything they see, anything that happens. It’s as detailed as it can be. There will be a date, a time, what hour of the morning or before dawn, who, what, where, when, why, it’s all in there. It talks about buildings, and buildings in the town, wooden buildings or hale, but they talk about worrying that the flow will head straight to Hilo town. 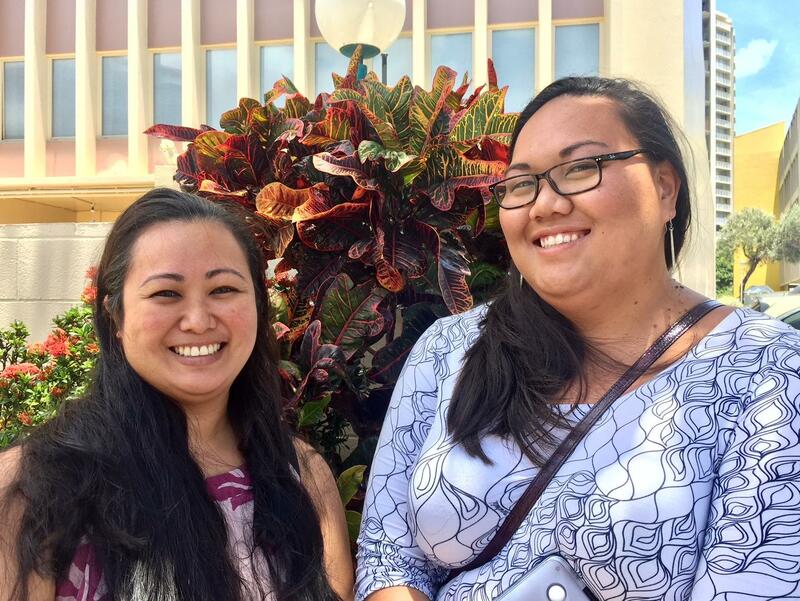 (l) Ano'ilani Aga, Adminstrator and Project Manager and (r) Paige Okamura, Graduate Research Asistant, both with the Institute of Hawaiian Language Research and Translation which, among other things, is studying, archiving, and making available the riches in Hawaiian Language newspapers. They flourished from 1834 to 1948. 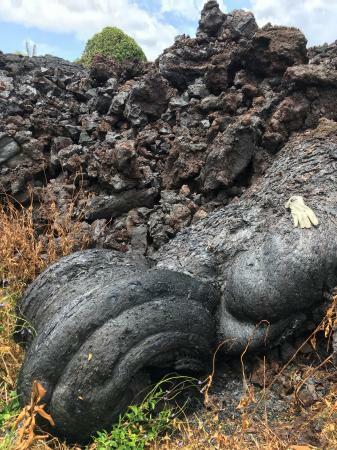 Ano’ilani Aga, Administrator and Project Manager for the Institute of Hawaiian Language Research and Translation says lava flows were reaching the sea on the Kona side in 1857. 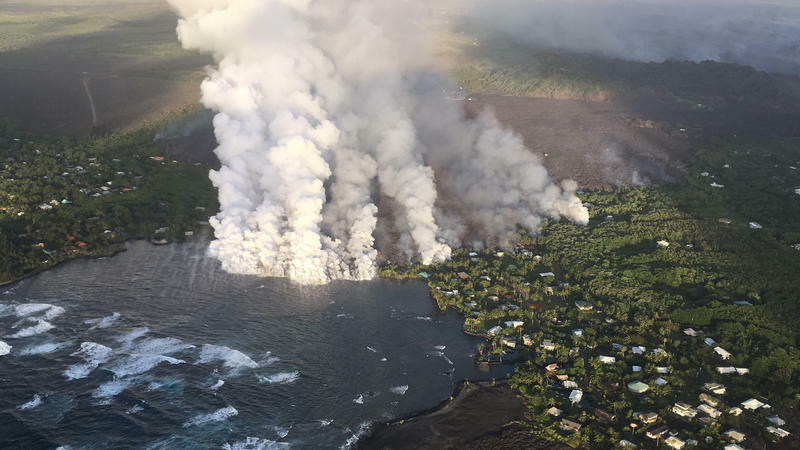 Aga: They mention how the lava destroyed some of the pools in different areas, so it's kind of similar to it happening now. These newspapers became historical record, many people had their copies bound at the end of every year. So for example March 27, 1868 an eruption is detailed with about 1500 earthquakes. Okamura: So you figure they're there, counting and keeping track of how many quakes that they're experiencing, rockslides, and they’ll run you through the strongest quake, the most terrifying one, the eruption of the lava at Keaiwa. What I think about in this eruption is people are talking about Puna falling into the ocean. Aga: That’s kind of how people are talking about the Hilina slump now, right? What impression do you have of recovery efforts? 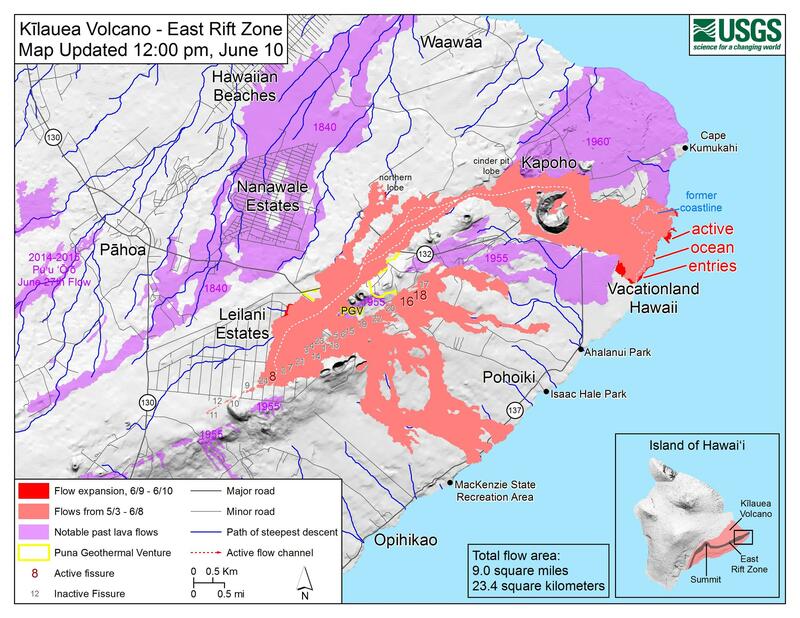 Volcano East Rift Zone map, updated 12 pm, June 10, 2018. Okamura: They tackled it in a very pragmatic way. They’re very empathetic and sympathetic with each other. Back then they weren’t look to the Kingdom to save them with money or supplies. 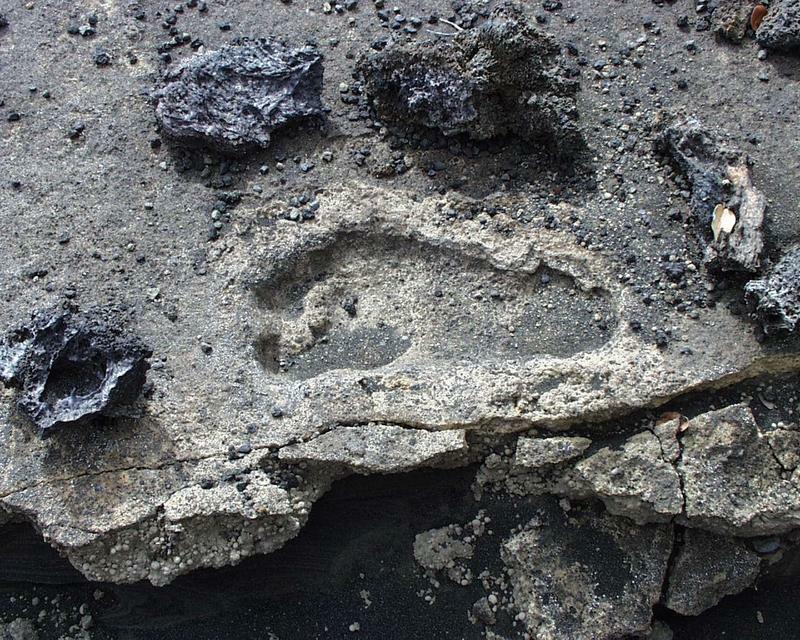 They were looking for supplies but this lava flow is something that happens, so what we see is this sort of stronger adaptive resiliency than we see today sometimes. Searching the Hawaiian newspapers data base is remarkably simple. As the site is under reconstruction, enter here and click your search terms. Looking back via the newspapers is so rich, because the very language sketches a time and place, and their concerns tell us about their lives. Aga: Can I mention another website that people should check out? Nupepa-hawaii.com. The promulgator of this site prefers to remain unidentified, but many trust and enjoy his work. Aga: Most times he picks articles that are relevant to what's happening today. Okamura: Couple weeks ago he threw up an ad for Leilani Estates in 1969, "$100 down for 1 acre! Invest in a promising area before everybody else does!" Old newspapers also tell us what we didn’t know. The man who unified the Hawaiian islands under one Chief began his conquests on the island of Hawai’i. Heading into Kamehameha Day weekend, let’s take a look at how Kilauea’s explosive eruption in 1790 may have advanced Kamehameha’s cause. HPR’s Noe Tanigawa reports.